WASHINGTON (Reuters) – The late President George H.W. 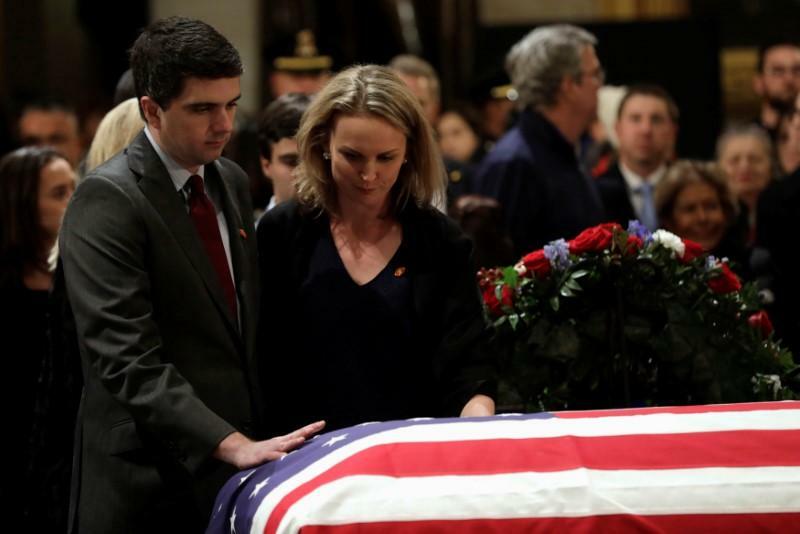 Bush was hailed at his state funeral on Wednesday as a World War Two hero, Cold War veteran and architect of a U.S. victory against Iraq who went on to represent a bygone era of civility in American politics. Bush, the 41st U.S. president, died last week in Texas aged 94. He occupied the White House from 1989 to 1993, and navigated the collapse of the Soviet Union and expelled former Iraqi President Saddam Hussein’s forces from oil-rich Kuwait. President Donald Trump shook hands with his predecessor, former President Barack Obama, who he has often sharply criticized, as he took his seat at the cathedral. Bush put together a U.S.-led international coalition that ousted invading Iraqi forces from Kuwait in 1991. Hundreds of people lined Pennsylvania Avenue in downtown Washington to watch a hearse drive Bush’s coffin from Capitol Hill, where he had lain in state since Monday night, towards the cathedral on Wednesday morning.